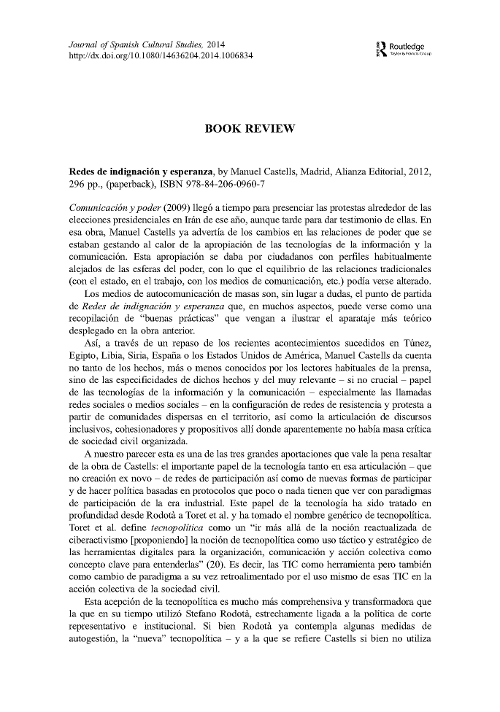 The Journal of Spanish Cultural Studies has just published a book review that I did on Manuel Castells’ Redes de Indignación y Esperanza ( Networks of Outrage and Hope in its English edition). Unlike most reviews — not my words, but someone else’s — my review is not just a description of what is in the book, but an actual review or, better put, a critique. Not necessarily negative one, mind you, but a reading with at least a critical eye. In my review — which, by the way, is in Spanish — I begin by telling why the book is relevant and comes at a perfect timing. Then, I go into debating on of the most important (to me) subjects of Manuel Castells’ trilogy on the Information Society and that the author revisits in his by now latest book: the question of space (or of spaces). Unlike what he did in The Information Age , though, his approach to the concept of space is somewhat changed here, and goes more in the line of what other authors have stated, like John Perry Barlow, William Gibson, Neal Stephenson, Javier Echeverría or Marc Augé. The paper can be downloaded at the following link, and the bibliography that I used can be accessed after the download section. Peña-López, I. (2014). “Redes de indignación y esperanza”. In Journal of Spanish Cultural Studies, 1-4. New York: Routledge. Alcazan, Monterde, A., Axebra, Quodlibetat, Levi, S., SuNotissima, TakeTheSquare & Toret, J. (2012). Tecnopolítica, Internet y R-Evoluciones. Sobre la Centralidad de Redes Digitales en el #15M. Barcelona: Icaria. Augé, M. (1995). Non-Places: Introduction to an Anthropology of Supermodernity. New York: Verso. Barlow, J.P. (1996). A Declaration of the Independence of Cyberspace. Davos: Electronic Frontier Foundation. Castells, M. (2001). La Era de la Información: Economía, Sociedad y Cultura. Vol. 1: La sociedad red. Madrid: Alianza Editorial. Corsín Jiménez, A. & Estalella, A. (2013). “The atmospheric person: value, experiment and ‘making neighbours’ in Madrid’s popular assemblies”. In Journal of Ethnographic Theory, 3 (2), 119–139. Manchester: University of Manchester. Corsín Jiménez, A. & Estalella, A. (2014). “Assembling Neighbours. The City as Archive, Hardware, Method, and “a very messy kind of archive””. In Common Knowledge, 20 (1), 150-171. Durham: Duke University Press. Echeverría, J. (1999). Los Señores del aire: Telépolis y el Tercer Entorno. Barcelona: Destino. Gibson, W. (1984). Neuromancer. New York City: Ace. Neale, M. (2000). William Gibson: No Maps for These Territories. Los Angeles: Docurama. Rodotà, S. (1997). Tecnopolitica. La democrazia e le nuove tecnologie della comunicazione. Roma: Laterza. Stephenson, N. (1992). Snow Crash. New York City: Bantam Books. Toret, J. (Coord.) (2013). Tecnopolítica: la potencia de las multitudes conectadas. El sistema red 15M, un nuevo paradigma de la política distribuida. Barcelona: UOC-IN3. Peña-López, I. (2015) “Book review: Networks of Outrage and Hope” In ICTlogy, #138, March 2015. Barcelona: ICTlogy.